Israel has prided itself on taking Jews from all over the world and making them new Israelis, but many immigrants are treated as second class citizens, many because of their different color skin, Amir Oren a senior columnist for Haaretz told RT. RT:We know that the protests by Jews of Ethiopian descent against alleged discrimination were mainly in response to the video showing an Israeli police officer assaulting an Ethiopian Israeli soldier. But does it go a lot deeper than this? Have these tensions been simmering for some time? Amir Oren: Obviously, this video clip only ignited the long simmering feeling of some injustice and perhaps inferiority heaped upon the Ethiopian community. People who are Jews and were extracted from Africa some 30 years ago... the Israeli government thought that it was doing them a favor- taking them out of medieval times as it was to modern-day Israel. But apparently they were treated as second class citizens. Their protest started last Thursday in Jerusalem. Today they turned to Tel Aviv. First the police had some sort of the modus vivendi with them and kept the distance, even though they blocked the main arteries of the Israeli highway system. 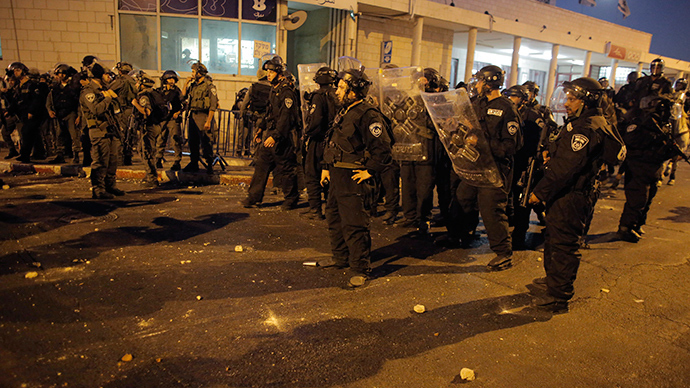 But later they came into the residential area around Rabin Square where the City Hall of Tel Aviv is also situated, and then things got out of control. RT:Do we know why things got out of control? You said those protests were meant to be peaceful. They are feeling subjective as ... they are not being treated fairly. And after 20, 25, 30 years it all burst out into the open, just when Benjamin Netanyahu who got most of their votes, incidentally, they are mostly Likud supporters, just when Netanyahu is about to form his next government. RT:Essentially we’re seeing clashes between Jews, aren’t we? But in any event the question is what has happened to the Israeli melting pot? Israel has prided itself on taking Jews all over the diaspora and making a new Israeli out of them. But it turns out they are second class citizens. Some of them are Arabs, some of them are immigrants from other countries, and some of them, because of their different skin color are Ethiopians. It is regrettable and Israeli society has a lot of work to do in order to rectify it.